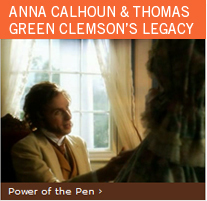 Clemson University is a living legacy of the vision of Anna Calhoun Clemson and Thomas Green Clemson. When he signed his will on November 6, 1886, Mr. Clemson bequeathed his farm of 814 acres and his fortune of $80,000 in cash and securities to establish "a high seminary of learning." Today, their legacy lives on through Clemson University and the Clemson family; a testament to the power of planned giving. The 19th century document was written with extraordinary forethought. It does not restrict the University's growth by tying it to one person or a single generation. It was structured to leave flexibility for growth, development, and improvement - which is the hallmark of a true legacy. Whether you are creating your will for the first time or revising an existing will, including a bequest for Clemson University is an easy and uncomplicated process. Bequests of funds may be expended for current operations or directed to establish an endowment. An endowed fund is one that cannot be exhausted and is preserved in perpetuity, supplying a constant source of financial support for the excellence the University seeks in academic, research, public service and athletic endeavors. Funds established in honor, or in memory, of individuals continue to echo their legacy as income is awarded to deserving recipients or applied to critical programs on an annual basis. A bequest to the Clemson University Foundation offers you the opportunity to provide Clemson with general support or to address an ongoing need of specific interest to you. Clemson is a dynamic university, and its priorities continually change to fit the needs of the time. Clemson requires flexible resources to maintain the purpose of its founding, which it has strived to do from its days as a military institution to the present. Your legacy can be upheld through the creation of an unrestricted Endowment for Excellence that will ensure Clemson's future. Included below are suggested phrases that may serve as a guide in selecting the type of bequests you wish to make to Clemson. These forms are intended as models for you to share with your legal adviser when your will or revocable trust is prepared and/or amended. "I give, devise and bequeath to the Clemson University Foundation, a nonprofit corporation organized in accordance with the laws of the State of South Carolina for the purpose of supporting Clemson University, an educational institution, located at Clemson, SC (choose from a, b, or c below)"
a) the sum of $______________. b) the following described property _________. c) ______% of the rest, residue and remainder of my estate. "This gift is to be used for the benefit of Clemson University to support current operations as it deems advisable with no restrictions." "This gift is to be used by (College/Dept./Program)_________________________ for the following purpose:____________________________________________________"
"This gift is to be used for the benefit of Clemson University to add to its permanent endowment. Income generated from this fund shall be expended for the benefit of Clemson University to support scholarships and current operations as it deems advisable with no restrictions." "This gift is to be used for the purpose of creating the __________________________." If you select a specific purpose for your gift, inclusion of the following sentence will ensure that the bequest remains useful through many decades. "If at the time this devise and bequest is received by the Clemson University Foundation, or at any time thereafter, the Clemson University Foundation Board of Directors determines that all or part of said income of the Fund can no longer be utilized to the best advantage for the purpose designated herein, then all or any part of the annual income may be used for such other institutional purpose which, in the sole discretion of Clemson University Foundation Board of Directors, shall most closely carry out my original intent." "I, JOHN DOE, hereby amend my Last Will and Testament, executed on the ____________ day of ____________________, in the year 20____. I direct that all provisions of that Will remain in effect but in addition I give, devise, and bequeath __________________________ to the Clemson University Foundation, a non-profit organization duly existing under the law of the State of South Carolina and located at Clemson, SC, to be used as the Foundation may direct or to be used for (unrestricted or a stated purpose)." 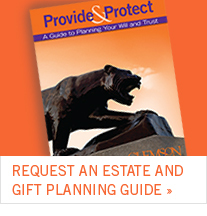 In the drafting of all devises and bequests having a restricted purpose, the Clemson University Foundation respectfully requests the Donor and/or their attorney please contact the Office of Gift and Estate Planning to discuss the details of the bequest/estate plan intentions so Clemson may properly steward the future gift when it is received. To ensure clarity, we propose that a Memorandum of Understanding (MOU) be created between the Clemson University Foundation and the donor(s) to outline the use and specific purpose of the Donor's gift. If you choose to name Clemson University or the Clemson University Foundation as a beneficiary, please let us know your plans. This will enable us not only to show our appreciation of your generosity, but also to include your support in planning for the future of Clemson University. Please see the Clemson University Statement of Future Gifts form which is used to outline your future commitment. We would be pleased to include you in the Clemson Legacy Society, which was created to honor individuals who follow the example of our Founders and have made the decision to have an impact on the future of Clemson University students.